A recent Gavop study found that Navy Federal Credit Union ranks number one in the top 10 home improvement mortgage lenders in San Diego, California, with 637 loan originations in 2017. Gavop used data from the latest Home Mortgage Disclosure Act (HMDA) to conduct this analysis. Wells Fargo Bank, National Association, follows at number two, with 372 originations in the year, and San Diego County Credit Union is at number three with 258 originations. Between 2015 and 2017, Navy Federal Credit Union has grown at a consistent rate of 8% from 589 loan originations in 2015 to 637 originations in 2017. Interestingly, Wells Fargo Bank, National Association, despite its second spot, has shown a almost 30% decrease in loan originations, from 4,737 originations in 2015 to 3,338 in 2017. San Diego County Credit Union at number three, has reported a tremendous growth rate at 486%, from 44 loan originations to 258 between 2015 and 2017. To give potential applicants a clearer picture of home improvement mortgages available, Gavop compared loan originations between the state and the city. In 2017, the number of originations in San Diego (3,954) declined by around 10% from 4,383 in 2016. Between 2015 and 2016 however, the city saw a nearly 40% increase from 3,123 to 4,383 loan originations. The state of California, on other hand, reported an 8% decline in originations, from 5,932 in 2016 to 5,454 in 2017. Between 2015 and 2016, the state witnessed an increase of 35% in loan originations. The following graph compares the top ten lenders by home improvement mortgage originations in San Diego for the last 3 years. The Gavop study also included an of analysis of the compound annual growth rates (CAGRs) of the top lenders for the last five years. First Republic Bank has the highest CAGR at 76.5%, followed by MUFG Union Bank, National Association at 38.0%, Synergy One Lending Inc at 29.4%, and San Diego County Credit Union and California Coast Credit Union at number four and five, with a CAGR percentage of 21.6% and 18.6% respectively. 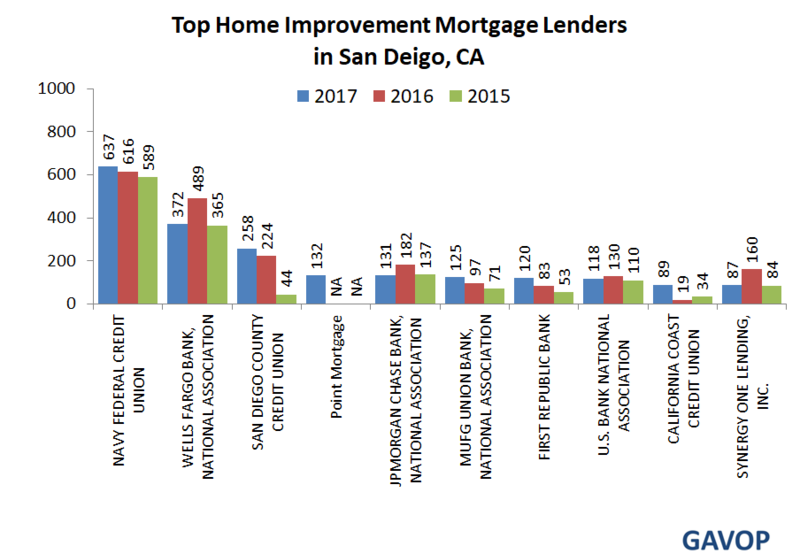 The table below shows San Diego’s top 10 mortgage lenders based on loans originations for home improvement in 2017. For more details & data on San Diego, California Mortgage Lenders, click on this link.